So was the Twitter Town Hall better than a regular one? The Obama administration, which has already had a live YouTube Q&A session and a Facebook “town hall,” upped the ante with a Twitter version on Wednesday, an hour-long session hosted by Twitter co-founder and chairman Jack Dorsey and held at the White House. Questions were submitted via hashtag, but it was far from a free-for-all, since they were filtered by Twitter using both its “relevance” algorithms and a series of human curators around the country. Was it a dramatic step towards transparency and openness by the U.S. government? Hardly. 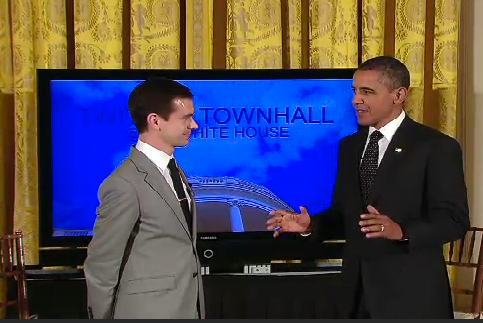 But this digital and interactive version was probably a little better than a traditional TV town hall. 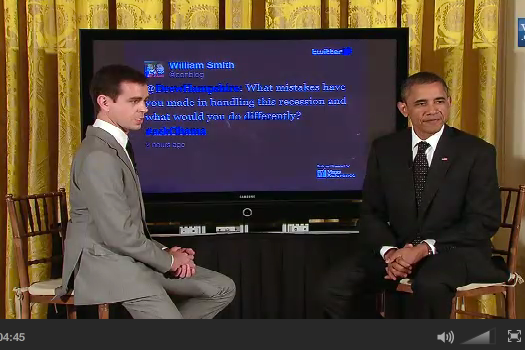 The event had its own site at Twitter.com built by Mass Relevance, which has also done similar live Twitter events such as the Academy Awards, and featured a live video stream, as well as a sidebar with the current question being answered and two Twitter streams: one of official White House tweets (most of which were Obama’s answers) and a second with tweets from everyone using the #askobama hashtag, which flowed by almost too quickly to read (the White House said after the event that archived video of the town hall will be available at the White House website and there is a transcript here). Mass Relevance said that 169,395 tweets were sent with the hashtag. The town hall started with a “live tweet” from the president — although for some reason, he chose to post his question (which was about what programs Americans would choose to cut if they had to balance the budget) on the @whitehouse Twitter account, instead of on his personal @BarackObama account, which the administration recently announced he would be posting to more often. The hour-long event then proceeded with Dorsey asking questions that came from the Twitter stream and were posted on a large video screen behind the two men. In some cases, the Twitter chairman chose questions that had been posted days earlier and other times he mentioned that the questions he was posing were posted “just five minutes ago” or “ten minutes ago.” Most were about the economy and the debt ceiling, as well as the job picture and tax cuts. Some appeared to come from the curators that Twitter arranged for, while others were described as being “retweeted a lot” — including one that was asked by New York Times writer Nick Kristof. Although Twitter described the process in a blog post, it isn’t clear how the curators were selected — they were simply described as “seasoned Twitter users with experience discussing the economy,” although the New York Times had some more details, as does The Atlantic — or whether their tweets and retweets were subject to the same kinds of relevance or engagement algorithms that was being used on the rest of the stream. In addition to its own filtering, Twitter also used Mass Relevance’s tools to find tweets worth asking, and Dorsey mentioned several times that certain questions represented 10 percent or 20 percent of the questions being asked. Kristof’s question, and a later one from Republican Speaker of the House Jack Boehner, were criticized by some for not being from regular Americans, but a member of the Twitter media team defended these choices, saying they were intended to represent the breadth of questions being posed via the hashtag. And some gave credit to Twitter for choosing to post the question from Boehner — which the president said was “slightly skewed” — as well as posing other questions that were clearly critical of Obama. And with questions from users with names like Renegade Nerd (which the president had some fun with), it was certainly more open to individuals than many other such events. So was the Twitter town hall revolutionary? Some said that it was: One 17-year-old user commented that he was glad to see that Twitter was “revolutionizing democracy during @BarackObama’s term the same way that radio was revolutionary during FDR era.” However, others — including the Columbia Journalism Review’s official account — suggested that it was filled with softball questions posed by a “lumpish” Dorsey. You know what really builds marketing synergies, and drives brand equity? Social media!! We’ve got it — let’s let people ask President Obama questions!! On Twitter!! Look: think about it: it’ll only take a day, and you’ll be seen as a hero. As more than one observer noted while it was happening, the Twitter Town Hall might not have completely brought down the walls between the White House and the American public or provided much news, but neither did the pre-digital versions of such town halls and similar public events. In most cases, those events would feature hand-picked attendees who would ask heavily scripted questions — and even press conferences at the White House are routinely criticized for being news-free, and relying on friendly relationships between the administration and certain journalists. So on that score, Twitter certainly levelled the playing field a little when it comes to actual dialogue between Americans and their president, even if it didn’t totally disrupt it. Great post Matthew! Interesting to see what other social interactions Obama has with the public..possibly with google? quora? Also what will his competitors do in this space leading up to the elections. Yet another channel to participate in a mutual lovefest between Obama and his press minions. Thank you Twitter for this latest installment of propaganda that would make Geobbels proud.